A Survey of Ancient Coins: ROMAN/Gordian III CE 238-244 Fortuna Redux with anchor? 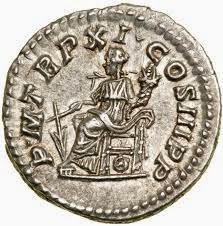 ROMAN/Gordian III CE 238-244 Fortuna Redux with anchor? R: FORTVNA REDVX, Fortuna std l, holding cornucopia in her left arm and an anchor with her right hand. It should be noted that what has been described in all the sources related to this particular depiction is that Fortuna is holding a rudder as she had been depicted in the past. In this particular coin it is clear that she is holding what appears to be an anchor. A Seleucid style anchor at that. Maybe due to the fact that the Emperor and his army relieved Antioch from a Persian threat, the anchor symbol so long associated with the history of the region was utilized at this time to specify that the returning good fortune is specifically Antioch's? Note the detail on the rudder as depicted in this photo obtained from the net of a denarius of Geta. Either the celator was just taking a short cut in his depiction or in fact he was depicting an old symbol familiar to the region.